Garmin Flagship Store — Valerio Dewalt Train Associates, Inc.
To strengthen its brand identity, this manufacturer of GPS-based navigation devices commissioned Valerio Dewalt Train to design a 15,000 SF flagship store on Michigan Avenue. The two-level store showcases the company’s newest and most innovative personal navigation devices and fitness products. The primary architectural feature of the store is a magnificent two-story sculptural, wood wall. 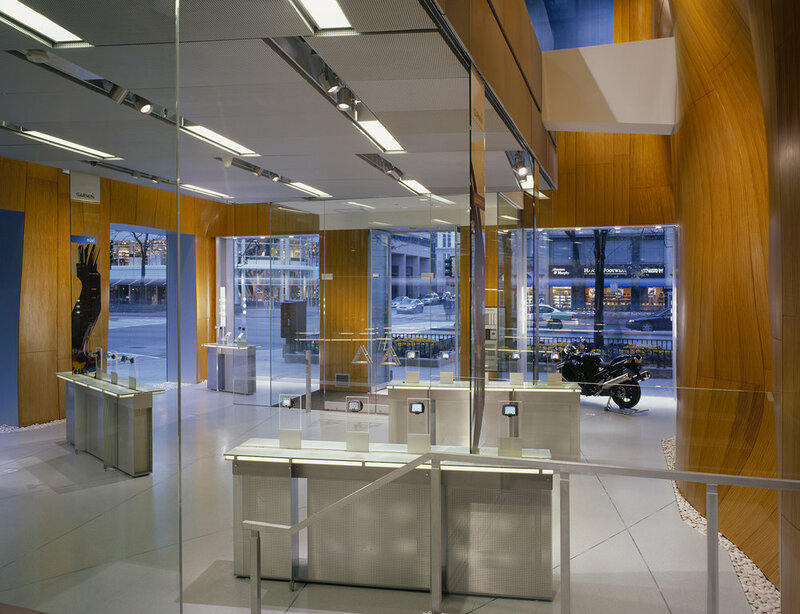 The wall serves as the signature natural design element of the store as well as a counterpoint to the inherent technological focus of the rest of the space. The undulation of the wood wall is reinforced by patterning on the terrazzo floor and lights in the ceiling that are defined by a Fibonacci mathematical progression, but also provides a dynamic contrast to the stairway, a folded aluminum plate that cantilevers from the wall and is enclosed by a plane of glass on its outer edges.